A Dutch technical inspection agency is using FLIR thermal imaging cameras to conduct inspections of aircraft cockpit electronics. Aircraft cockpit inspections, both pre-flight and post-flight, consist of a wide range of control routines carried out to ensure the safety of passengers during a flight. It is important for these inspections to be carried out as efficiently as possible to minimise idling of the aircraft on the ground. 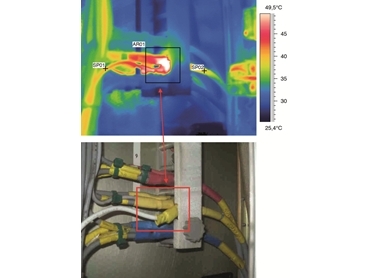 Dutch technical inspection specialist Thermografisch&AdviesbureauUden BV found a way to significantly speed up electrical inspections inside the cockpit, while at the same time guaranteeing accuracy and reliability using thermal imaging technology from FLIR Systems. Thermografisch&AdviesbureauUden BV is an experienced agency specialising in independent inspections and supplying recommendations to the industrial and construction markets. The company’s expertise ranges from building inspections, over climate and mechanical installation inspections, to process control and inspection of electronic components. For all of these applications, Thermografisch&AdviesbureauUden BV heavily relies on thermography. According to Mr Ralf Grispen, owner of Thermografisch&AdviesbureauUden BV, while they regularly performed inspections of electrical cabinets for industrial applications using thermal imaging cameras, they had never applied this technology for the inspection of cockpit electronics. Thermografisch&AdviesbureauUden BV’s long-term customer Star Air, a Danish cargo airline and part of the A.P.Moller-Maersk Group, specialises in providing highly reliable cargo lift capacity. Star Air knew the agency could successfully perform inspections of water ingress in composite materials of airplanes by means of thermal imaging cameras. However, the technicians of the airline company wanted to know if the same technology could be used for the inspections of wiring and cabling inside the cockpit. Mr Grispen and Mr Rob Huting, co-owners of the company, travelled to Cologne Airport, where Star Air’s aircraft fleet is located. Technicians of the airline company readied the cockpit of a Boeing 767-200 for electrical inspections, and the Thermografisch&AdviesbureauUden BV team started its routines. The inspection job was a success: the thermal imaging cameras showed the temperature differences of the cockpit’s electrical cabinets in the greatest detail and the team was indeed able to detect an initial defect in a resistor. The test also resulted in a contract award to Thermografisch&AdviesbureauUden BV by Star Air for the maintenance inspection of 11 Boeing 767-200 freight aircraft. Mr Grispen explains that thermal imaging technology, in the case of Star Air proved to be a perfect fit for preventive maintenance and electrical inspections inside the cockpit. FLIR’s thermal imaging cameras are enabling the company to get the job done in a fast, accurate and cost-effective way. The main advantage of thermal imaging in cockpit inspections is that electrical problems can be located very quickly and accurately. Mr Carsten Holm, Vice President Technical at Star Air, comments that they encourage the use of thermal imaging for cockpit inspections because it gives an accurate view of the aircraft’s condition, helping them ensure all equipment is in perfect state and that cargo and crew can enjoy a safe flight. Thermografisch&AdviesbureauUden BV is using the FLIR P640 thermal imaging camera, a high-resolution thermal and visual camera that has a host of advanced features, which makes it a smart choice for thermal imaging surveys. The high resolution camera enables the smallest electrical parts as well as the smallest temperature differences to be viewed while the large colour LCD allows the technician to simultaneously share the images with customers or colleagues. Striking a very good balance between robustness and ergonomics, the camera can also be used to make short movies. Key features and benefits of FLIR P640 thermal imaging cameras include simple operation; accurate temperature measurements delivered from safe distances; greater temperature measurement accuracy, particularly for small objects; and extensive reporting capabilities. Thermografisch&AdviesbureauUden BV makes use of the services of the FLIR Infrared Training Center (ITC), with three of their people fully FLIR ITC certified. The company also regularly attends training sessions organised by FLIR Systems .